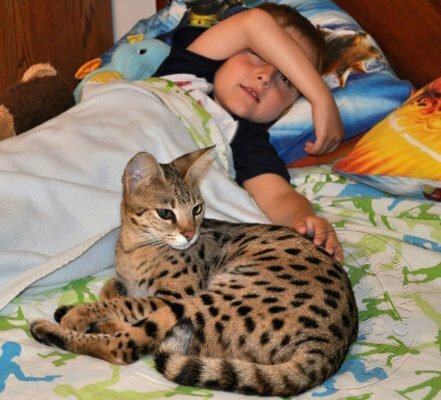 All generations of Savannah cats and children happily share a household. Proper socialization from the breeder and responsible ownership are key. It can also be a great thing since both have plenty of energy. Savannahs need a lot of enrichment and most children are more than happy to accommodate them with a game of chase, fetch, or hide and seek. There are a few things to keep in mind when choosing which generation Savannah cat is right for you. F1’s and F2’s can be challenging for a household with small children for a few reasons. Early generation Savannah cats are closer to the Serval and demand a lot of attention. They tend to bond with 1 or 2 people and are more aloof with strangers and children. F3’s and later generations are much more accepting of a busier household and more relaxed with the entire family. Some Savannah cats are around children from birth. If you have children and are planning to add a Savannah cat to your family, it is a good idea to seek a breeder who has children in the home. This way they have experience with the little humans, All of the extra excitement, and noise, that they bring to a household will not phase the kitten. That being said, a well-socialized kitten from a reputable breeder, with a quieter home, can also adapt to their new environment fairly easily. Savannah cats are notorious for picking their humans. They often choose a child living in the home to bond more closely with. Don’t let it surprise you to find that your Savannah cat, that you want for yourself, cuddles up at night with your child. It is always best to supervise Savannah cats and children. Your child will soon be old enough to be trusted on their own with the kitten. Some organizations would love for you to believe that Savannah cats are wild and that they do not make good pets. This is simply not true! Savannah cats are loving, intelligent, energetic, and exotic looking members of many families worldwide. The Savannah Cat Association recommends later generation kittens F3 and later for families with very small children.